President Thomas S. Monson, Second Counselor in the First Presidency, also spoke, pointing out that as a successful businessman, Elder Stone nevertheless followed the Savior’s admonition to focus his greatest efforts in life on things that were heavenly, not earthly, treasures. Among these treasures were his wife, Dorothy, and his sons, daughters-in-law, and grandchildren. Another of Elder Stone’s treasures was the testimony he so frequently bore. President Lorenzo Hoopes of the Oakland Temple, a long-time friend of Elder Stone, read a biographical sketch. President Gordon B. Hinckley, First Counselor in the First Presidency, conducted the funeral service. Elder David B. Haight and Elder Marvin J. Ashton of the Council of the Twelve gave the invocation and benediction, respectively, and Elder James E. Faust, also of the Twelve, dedicated the grave before the burial in the Salt Lake City Cemetery. Elder Stone, eighty-two, had been in failing health. He died at his Salt Lake City home 26 April 1986 of natural causes. He had been an emeritus member of the First Quorum of the Seventy since 1980, having been a member of that quorum since its organization in 1976. He had served as an Assistant to the Twelve since October of 1972, and also as president of the Salt Lake Temple for four years before his calling as a General Authority. O. Leslie Stone was born 28 May 1903 in Chapin, Idaho, a Son of Frank J. and Mabel Crandall Stone. Following his public school education, he attended Brigham Young University for a time before going into the grocery business with his father and a brother. Eventually, they operated seventy Stone’s Cash Stores in Idaho. In the 1920s, their stores were sold to M.B. Skaggs, organizer of the Safeway Stores. 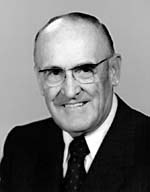 Leslie Stone joined the Safeway organization as personnel director and worked his way up to executive vice-president before he and his employer formed Skaggs-Stone Wholesale, a general merchandising company, in 1946. In addition to his callings as temple president and as a General Authority, he had served as a bishop, president of the Oakland-Berkeley Stake, chairman of the Oakland Temple District during planning and construction of the temple, and as a regional representative. Elder Stone served for several years as Executive Director of the Church’s Temple Department before being named to emeritus status in his quorum. O. Leslie Stone married Dorothy Cobbley of Blackfoot, Idaho, 23 April 1924 in the Salt Lake Temple. She passed away last September. Their sons James Reed Stone and Douglas Leslie Stone also preceded him in death. Sons Ronald V. and Thomas R. both live in Modesto, California. The Stones have seventeen grandchildren and fourteen great-grandchildren.